The year 2019 is shaping to up be an exciting one for Bid4Assets. Today, we are celebrating the 20th anniversary since we incorporated on February 19th, 1999. Since that day, Bid4Assets has been revolutionizing private and government property sales with our online platform. In that time, we have sold over 100,000 properties, grossed over a billion dollars in auction sales and hosted online auctions for over 100 federal and county clients nationwide. It has been an incredible journey and our entire team could not be prouder of all we have accomplished. But we aim to do more with this occasion than just look back on 20 years of success. We aim to ensure that our next 20 years are even better than the first. The concept of Bid4Assets originated when our founders were on the courthouse steps bidding on a foreclosed building during a cold, snowy day in Baltimore. They realized there had to be an easier way to buy and sell higher-valued assets like real estate, so they created an online platform designed to create a more convenient experience for buyers and sellers everywhere. This mission has been part of our DNA since day one and it has directed every new decision, site update and policy we have implemented since then. With that in mind, there are several new features we are in the process of rolling out for 2019. Our first big announcement of the year is a new notice of sale program. This program is designed to provide free information on live public auctions and to ensure more counties nationwide benefit from our extensive base of real estate investors, developers and buyers like you. Additionally, we are in the process of developing a customizable auction alert tool accessible to all users. When this goes live, Bid4Assets users will be able to tell us exactly what kinds of properties they are interested in and receive automated alerts whenever properties of that type are available on the platform. The purpose of this program is to streamline your auction searches and help you get quick and easy notifications on the properties you want and avoid the ones you don’t. As for here and now, Bid4Assets is happy to offer unique promos for private auction sellers to mark this special occasion. Contact Bid4Assets’ client services team at [email protected] from now until March 19th to learn more about these unique promotional opportunities. There has never been a better time to be on Bid4Assets. If you are new to the site, sign-up for our email alerts to get the latest news on our most exciting auctions, website features, educational webinars and much more. If you’ve got property to sell, consider submitting an application for our seller program. Whether if you’ve been with us for the last five, ten or even 20 years, we hope you’ll sell with us again. Finally, to all our registered buyers, we want to say thank you. Whether you have bid on one or one hundred auctions using Bid4Assets, you have helped us get to where we are today. Our team strives every day to create a platform we can be proud of and that creates as many opportunities for buyers and sellers everywhere. Thank you, we never stop appreciating you and here is to the next 20 years. In our 20 years of providing online real estate auction services to buyers and sellers nationwide, Bid4Assets has always looked for new innovations we can bring to the table for our subscribers. That’s why we are proud to announce that Bid4Assets is now offering free notice of sale for live public auctions as a courtesy to all users. From now on, you will find these notices throughout the site providing information on live tax sales, foreclosure auctions and other public auctions all over the country. These pages will display the date of the sale and other basic public records information. We obtain this information from third-parties who specialize in public auction data. You can check whether Bid4Assets is promoting a sale near you by selecting your home state on the map of the United States located on the Bid4Assets homepage. This will bring up a full list of the auctions Bid4Assets is hosting in that state as well as any live county tax sales we are currently promoting. To view a full list of the sales Bid4Assets is promoting, type “Notice of Sale” into the keyword search tool accessible in the top right-hand corner of nearly every page of the site. Additionally, you can subscribe for Bid4Assets’ Wednesday email alerts to keep up to date on both the latest county tax sales being hosted on Bid4Assets and the latest live auctions we are promoting through Notice of Sale. Keep up with our email alerts to make sure you don’t miss a single auction opportunity! 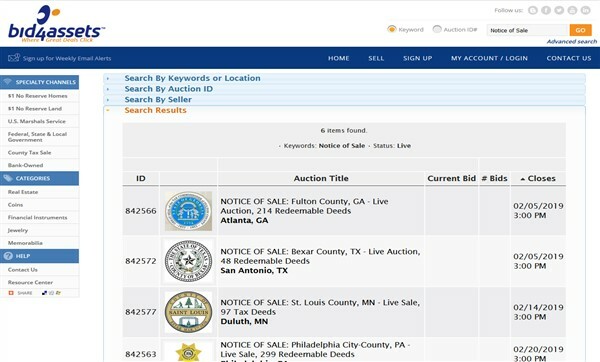 Bid4Assets has provided online auction services for over 100 government agencies nationwide and we continue to add new agencies every year. That said, we understand there are many counties who are not yet ready to take their process online yet. We hope this notice of sale program brings opportunities from those sales to the attention of our subscribers and generates interest in new public auctions nationwide. 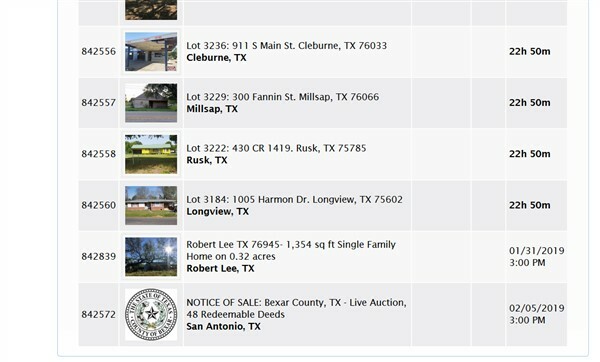 We want Bid4Assets to be your best source of information for tax sales and other government real property sales. Please bookmark Bid4Assets and subscribe to our email alerts to keep up with the latest public auction notices. So the auction is over, the settlement is complete and you finally have that perfect piece of vacant land. Now the question is what should you do with it? Many people who buy land on Bid4Assets report having bought it for a fraction of market price. Buying land at a discount at auction leaves you more capital to develop or otherwise improve the land for profit. A new piece of vacant land is a blank canvas, often with many unique possibilities. Some investors want to resell their property (either on Bid4Assets or through an agent) for a profit. Others may plan to build their dream home or a rental property. Regardless of what your plan is, the most important thing is to have one. With that in mind, here are just a few ways you might put your land to good use. The #1 reason people invest in land is for development. Whether you want to create a dream home for your family or develop something you can sell for maximum profit, don’t let your investment sit unutilized. Your local chamber of commerce may be able to help you find local real estate developers and home builders. If you’ve bought vacant land located within walking distance of a major attraction, such as a sporting arena, a theatre, or a popular downtown area then you control a space where people frequently need parking. Check with the county planning office to see if parking (be it event parking or ongoing) is an acceptable usage for the property. Land can be easier to rent than homes and commercial buildings as it requires the most basic amount of maintenance. When possible, renting land is a great way to produce income while your property appreciates. Properties can be rented to campers, for parking, or for an assortment of commercial uses. It’s important to check with the county to make sure any land usage confirms with the zonings and that you have any necessary permits. No matter what you ultimately choose to do with your land, the most important thing is to do your due diligence and have a clear plan. We love to hear from our auction buyers, if you have a great land success story, please email us at [email protected] and tell us about it! Vacant, raw, bare, undeveloped … these are generally not words you would associate with an exciting investment opportunity. But when you pair those words with land, you get one of the most stable and overlooked, long-term real estate investments available. 1) Vacant land can be a no-fuss investment. Vacant land means simplicity and stability. You don’t have to deal with any of the problems that can come with owning other types of real estate. There are few, if any repairs, no tenants, no renovations and no utilities. 2) Land is cheap to own. After the initial investment, raw land property taxes are typically low. There are no mortgage payments, no monthly bills, and the insurance is minimal if you choose to have it at all. 3) Buying land can be extremely easy. Companies such as Radius, a frequent lister on Bid4Assets, make finding your next great land deal as easy as buying a new DVD player on Ebay. You can browse from your favorite living room chair, review pictures and due diligence, and place your bid, all from the comfort of your own home. 4) Land is a tangible asset. While your stocks can become worthless paper overnight, you’ll never face that problem with land — it’s still there. Land is a solid, tangible asset. It doesn’t wear out, it won’t break and no one is going to walk off with your land in the middle of the night. This famous Mark Twain quote may sound cliché, but land is a finite resource. As a population grows and the demand for land rises, and that trend isn’t going away any time soon. So, if you’ve overlooked vacant land as an investment opportunity in the past, there’s no time like the present to start. Many great deals are already available on Bid4Assets and only a click away. The Treasurer-Tax Collector's Office of Mariposa County, California is offering 6 tax defaulted properties for auction online. The Treasurer-Tax Collector's Office of Calaveras County, California is offering 65 tax defaulted properties for auction online. The Treasurer-Tax Collector's Office of Nevada County, California is offering 45 tax defaulted properties for auction online. The Pierce County Assessor-Treasurer is offering 261 tax-foreclosed properties for auction online.